India has numerous paths to spiritual goals, and in this book the author encounters nine of them. He is known as a travel writer so anyone seeking a deep analysis of the history and theology of these paths will be somewhat disappointed. But only somewhat: Mr Dalrymple’s research has been considerable and he fills in the history and theology where relevant. The travel part of the book is taken care of by the variety of settings and the vivid descriptions the author provides. It’s easy to understand why so many of his previous books have won prizes. He keeps himself and his opinions in the background and lets the people he interviews speak in their own words (in translation actually as they spoke eight different languages). So what we get is partly nine autobiographies, which are not only about religion but also give an insight into the society of modern India. We Nayaks are from a very low caste … . Still to this day we cannot eat or drink in the house of many of the people in this village. But when we recite or perform as bhopas, this brings us respect. … The greatest pleasure we have is here, with her [Ma Tara]. It is here in this place of death, amid the skulls and bones and funeral pyres, that we have found love. The other women too, the Jain nun, the temple prostitute and the Sufi mystic, all speak of love in many forms, but mainly for and from the divinities they worship. There is also a good deal of sadness; some have lost their families, as one of the Baul singers had, and others their homeland, like the refugee monk whose life left him with no peace of mind. Even one of the most successful, the Maker of Idols, looks like being the last of a 700 year family tradition – his only son wants to be a computer engineer. Apart from the occasional mention of computers, CDs, and various vehicles, there isn’t much of urban, big business India in this book. It lurks in the background, sometimes eating into a tradition or a belief, but on the whole these people seem to keep their sacred traditions and ideologies alive and very active. Thank you for raising the point about how much do we know about our own part of the world. I think I’m incredibly ignorant about most of Europe – and that’s smaller than India. 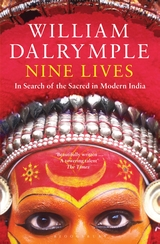 Isn’t it lucky that we have great writers like Dalrymple around to gather the information for us and let us learn more? I feel I learned a lot about India from his book, but I realise there’s a lot more to know.